With bright orange to red flowers that attract birds and bees to the garden, Greyia sutherlandii is a small to medium sized shrub with a naturally open framework. Not widely offered for sale, yet ideal for hot dry Australian conditions we think this is a plant that deserves a little more attention by the industry and gardeners. The flowers appear as dense bottlebrush like spikes and last well as cut flowers. From South Africa, this is a hardy easy care plant once established. A sunny position with at least 6 hours of sun is best. A well drained soil is essential. Dig soil over well before planting and improve drainage if needed. Mulch around the plant to maintain a cool root run and help suppress weeds. Water during long dry periods over the first few summers. 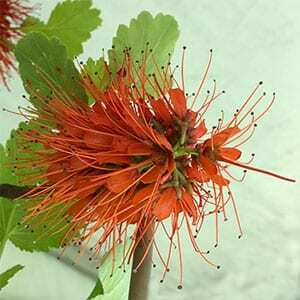 Common Name – Natal Bottlebrush, South African Bottlebrush, Beacon Tree.